I ｗas born and raised in Tokyo. Lived for a few years in Tehran (Iran) and Seattle Washington (U.S.A.) in early childhood. Worked for a Swiss bank and a Canadian forestry company for 8 years respectively. Served as a teaching assistant of the Japanese language course for two semesters at the University of Wisconsin, Oshkosh in the United States. Have been working closely with a trading company in Japan for more than 10 years to help correspondences with overseas partners as well as to attend Japanese and overseas partners in and outside Japan as interpreter and tour guide. Qualified as licensed tour guide in 2003. Love open-air Onsen (or hot springs) !! Friendly “Tokyoite” who love my city. I would be happy to show you around in Tokyo and other areas depending on your interests. 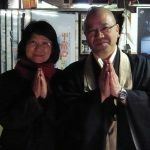 I am willing to assist you explore different aspects of Japan and experience the Japanese culture. I will try my best to accommodate your desire and hope you will have a wonderful and memorable time during your stay in Japan. Look forward to meeting you soon in Japan!